Say Hello to the Toughest & Most Reliable Handgun Safe on the Market. 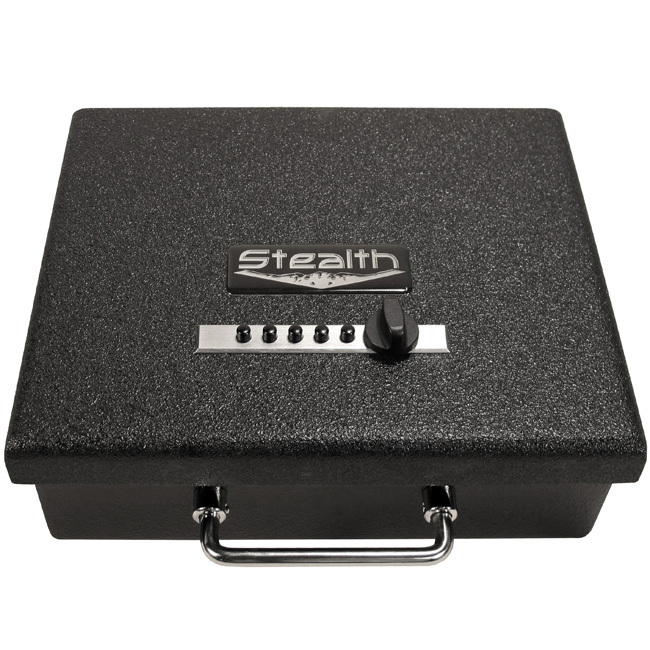 Made with thick 10 gauge solid steel and a massive 3/16" solid steel wrap around door, the Stealth Tactical Handgun Safe's security is equivalent to most full size gun safes and substantially stronger than any other handgun safe available. In comparison to the Fort Knox Original Handgun Safe, the Stealth Pistol Safe adds (2) 3/8" Steel Lugs, a thicker chromed locking bolt and two solid steel deadbars. These features in conjunction with the welded, continuous hinge add a significant amount of additional pry resistance to the safe and make it near impossible to break in while the safe is bolted down. 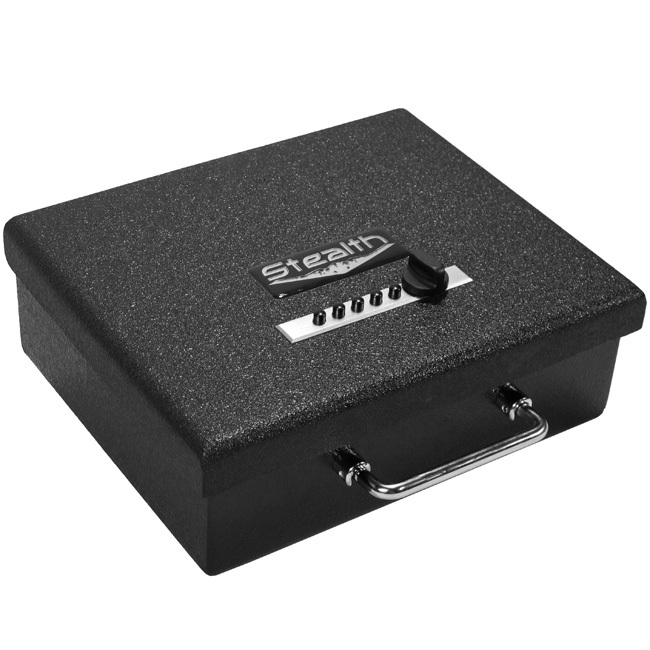 On the top of the Stealth handgun safe, you'll notice the easy to use, highly reliable Simplex Lock. No batteries, no electronics, no failing biometric reader, just a reliable open every single time. With a potential of 1,081 unique combinations, it would take a burglar hours to try every combination and compared to an unreliable electronic lock, you actually get more combinations than the standard 4 push button. For those who know of the "punch" method where a thief will take a chisel or hammer and literally "punch" in the lock common among similar style handgun safes, Stealth added another security feature by encasing the lock in steel and creating a punch resistant housing. Even if the burglar smashes the lock, your valuables are still safe inside. After the correct combo is entered and you begin to open the heavy duty door, you'll notice a helping hand in the gas piston assist that helps lift the lid and hold it in place. 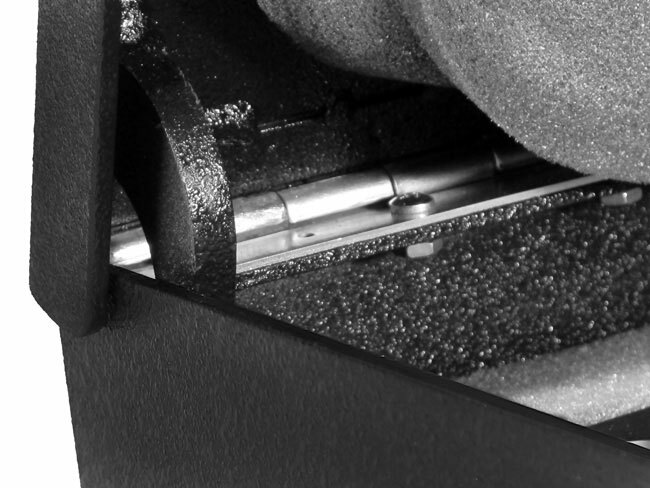 Once open, the protective, high density, pluck foam interior will allow you to fully customize to the exact fit and finish of your firearm and magazine. 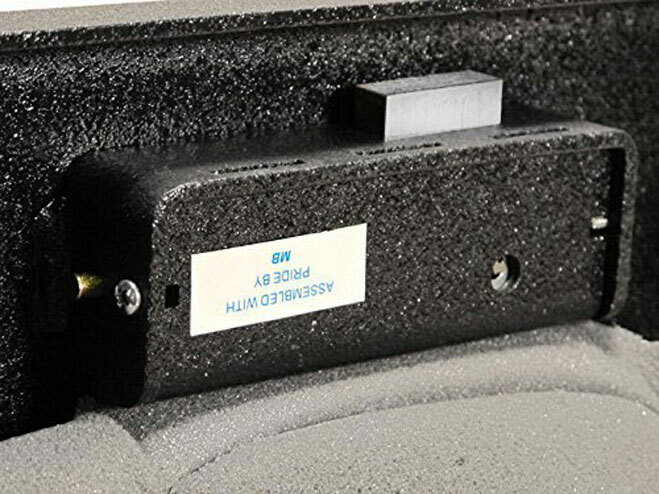 With the four pre-drilled bolt down holes you can mount this safe to any car, nightstand, drawer or flat surface for that matter and even fit a master lock security cable through the mounting holes in the event you want to use its portable feature. Speaking of portability, the Stealth Pistol Safe adds a chrome plated carrying handle that will allow easy and secure transportation of your firearm. From the safe to the range and everything in-between, Stealth Tactical provides efficient, secure weapon storage in an elegant finish. This gun safe meets the safety standards for gun safes specified in California Penal Code Section 12088.2.1, which mandates that all firearms sold in California be accompanied by a firearms safety device or proof of ownership, as required by law, of a gun safe that meets the Section 12088.2 minimum safety standards developed by the California Attorney General under the item name: AMSEC PS1210HD. The Stealth Heavy Duty Pistol Box features a thick brass bolt, a combo change button for easy programming and solid steel, punch resistant housing that encases the lock. 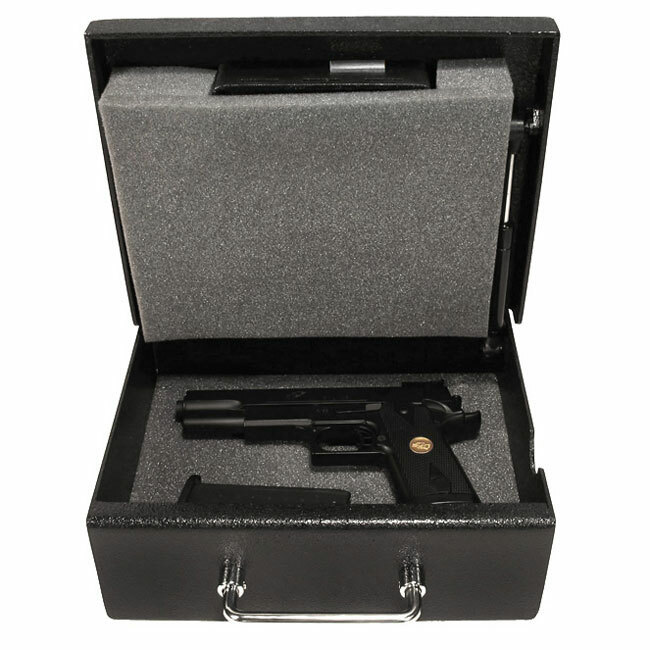 The Stealth Heavy Duty Pistol Box comes standard with a protective, high density pluck foam that can be customized to cradle the form of your gun. The Stealth Heavy Duty Pistol Box Steel Lugs and Hinge features two 3/8in steel lugs that hook around two solid steel deadbars upon closing-- making this safe nearly pry resistant once bolted down. This safe comes standard with a Simplex Lock. Save yourself the hassle and let us set your combination for you. Select "Yes" in the drop down menu and we will call you to set up your personalized combination.